The Maratek Solvent Saver Printing (SSP) equipment uses a multi-stage vacuum solvent distillation process that separates solvent into its components at lower-than-boiling point temperatures. 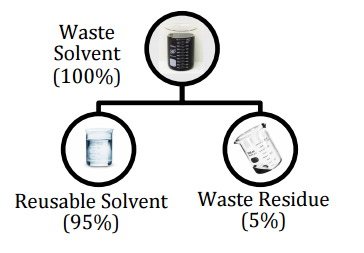 Any waste solvent waste residues are self contained within the unit. Distilled water can usually be sent down the drain, and the reclaimed solvent is ready to go back on the press - and it's as good as new. The Maratek SSP unit is an off-press automated solvent recycling machine that, once installed, needs very little attention. Switching out drums and using our touch-sensitive control screen is virtually all the labor that is required. It has a small footprint and because it operates at low temperatures, its explosion-proof design is safe for installation in the pressroom. 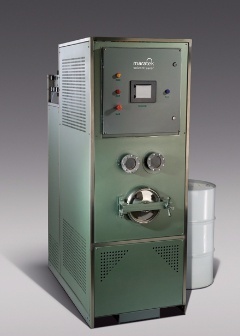 The Maratek SSP solvent recycler models can be designed to handle many different outputs. Operation is fully automatic via a PLC controller with a color LCD touchscreen interface. With the Maratek SSP models, you can run 1 drum of solvent through your press over 10 times before you have 1 drum of waste to ship.